It has been a busy year and we have been diving nearly every week to keep up with all the projects in the lab. 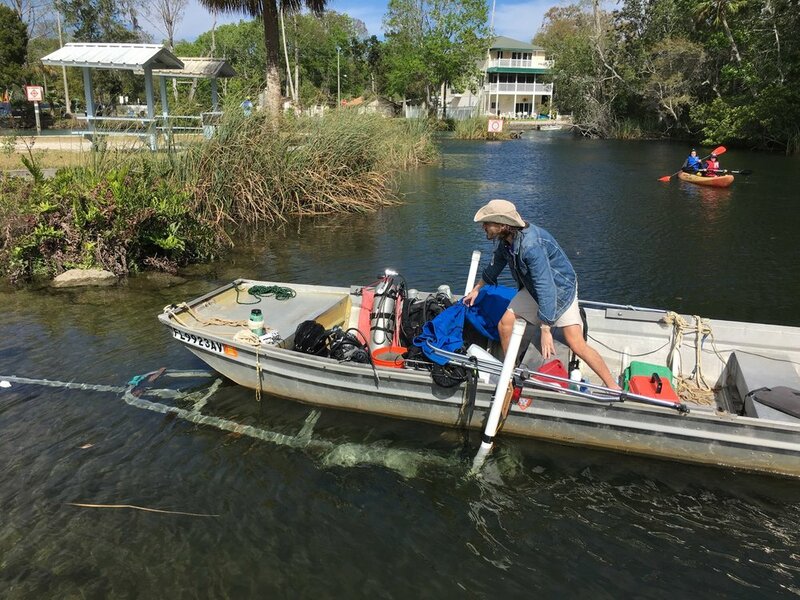 Last week we dove Sulphur Springs to exchange some instrumentation that had been in the spring conduit since November and to get some much needed samples. This week we went back to Hospital Hole. For the first dive we dropped a bucket of cement as a weight tied to a line that connected to a surface buoy. You can see the buoy in the photo below. It immediately attracted all the manatees. Bobby and Dr Garey went down the line, measuring the distance from the line to the wall using a hand held underwater sonar device. We determined that the hole is about 50 ft across at the top, and about 130 ft across at the bottom. We removed the bucket and buoy at the end of the dive. On a second dive, we did some exploratory diving, documenting many of the smaller vents and odd patches of biofilm. It was a cold day and Madison did a great job providing boat support.